← ANALYSIS-Violence, “old boys’ clubs” put women off life in politics but at what cost? Rolando Marín, an economist with postgraduate qualifications in economic law and development, replaces Marcia Villarroel as national manager of the lender. Marín, also a university lecturer and a published author, was a member of the central bank board and its vice president from 2007-14. The appointment comes after President Evo Morales announced a crackdown on corruption and other types of white-collar crime and after Villarroel was asked to step down. “I want to tell you that, during our administration, embezzlement, theft and corruption will not be forgiven,” Morales said during a press conference ahead of a ceremony where Marín was officially named Villarroel’s replacement. 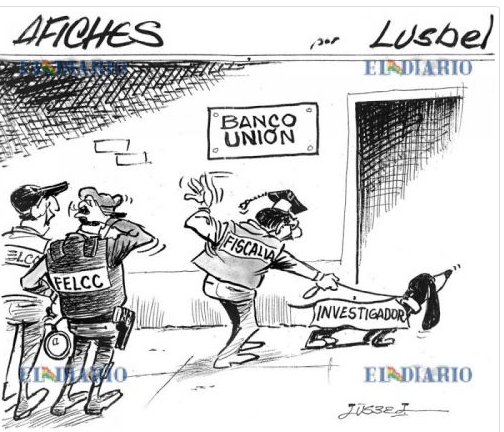 Earlier this year state investigators discovered that, over 10 months, 37mn bolivianos (US$5.35mn) had been embezzled from the bank. One of its managers, Juan Pari Mamani, has been accused and was remanded in custody in September, state news agency ABI reported. Pari worked at a branch in Batallas, a municipality about 50km from capital La Paz. 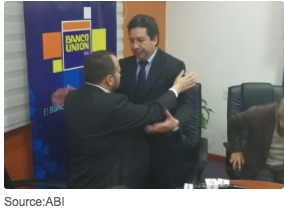 Bolivia’s association of private banks Asoban recently called on the country’s financial institutions to overhaul internal monitoring systems to help prevent embezzlement. ” data-toggle=”tooltip”>Asfi, is part of financial services group Grupo Unión. Authorities said the bank remains financially healthy despite the loss. Marín (pictured, on the right) was sworn into office by the head of the bank’s board of directors, Diego Pérez Cueto (on the left). Bolivian Thoughts opinion: The hypocrisy and disdain of current Bolivian president is outrageous! This article suggests that changes were made because of his concern! Almost a month went by without any signals, even the police was asked to step out of this “inquiry” … had it not been for social media, Bolivian public opinion who just had it with the almost daily corruption scandals under this government made that change possible! This egocentric “leader” who only wants to remain in power, no matter the cost and harm to our democracy is the main source of this rampant corruption. He claimed that the indigenous were the moral base of the society, he also appointed acolytes who had little if any academic or professional background to assume executive positions, only resulted in an ochlocracy! As more news are disclosed on this flagrant theft that proved no controls existed in the Bank that had ALL State financial operations, it becomes clearer that incompetence, negligence and no ethics, let alone accountability, were never present under this sorry excuse of a government! News that pop up everyday on this case sound like bad jokes, the way the first accused,Juan Pari Mamani, displayed his “wealth” on public media is pathetic! 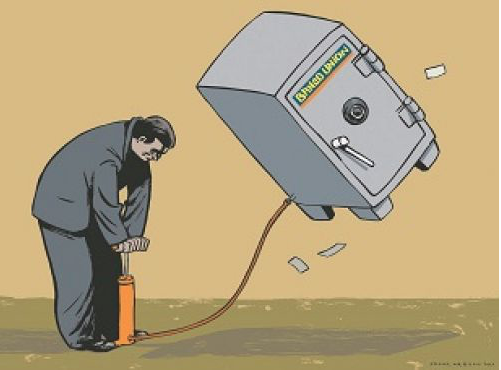 How could this person was able to extract millions of bank notes without control?! He is reported to have slept in the vault, huge cash amount were never accounted for, how could a tiny branch requested so many cash and no controls alerted of this?! Even a newspaper that has “strong” linkages with this government reflects this corrupt case, La Razon. Which again, reflects my initial opinion: evo did nothing about this corrupt case, until the pressure from the Bolivian society became unacceptable and he had to give some signs towards clarifying this theft! 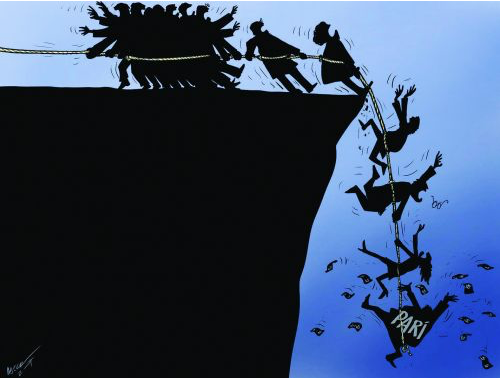 This entry was posted in Bolivia, Business, Crime and Violence, Economics, La Paz, Politics, Social Unrest and tagged bad politics, corruption in public office, demagogue, Ochlocracy. Bookmark the permalink.